Short synopsis: Sasakura Ryuu is an incredibly talented bartender known for making the "Glass of the Gods." He works at a small, nondescript bar called Eden Hall. It is there that people seek this genius bartender out and find their own "Glass of the Gods" to soothe their unique problems. 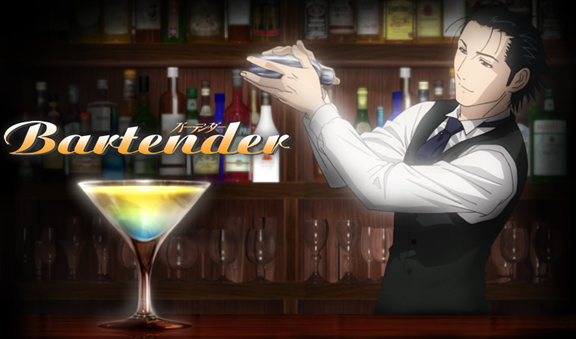 Being a show about a bartender, this show obviously has a lot of alcohol references that flew past me. As such, a lot of the drinking novelty will be lost on those under 21. It's likely that if you are over 21, you will enjoy this much more than a teenage anime blogger with nothing better to do than watch an anime about drinking although the only alcohol she's ever tasted is wine and champagne. And although I may not have been able to enjoy it as much as someone over the alcohol-guzzling age of 21, I didn't feel too overwhelmed, and I did learn quite a lot about alcohol (though the legitimacy of some of the facts is questionable). 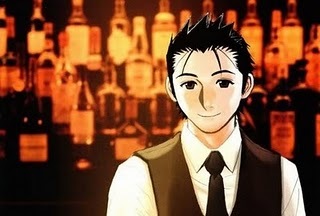 Actually, the most entertaining thing about Bartender was the huge variety of stories customers told Ryuu. Almost every episode had a different customer with problems unique to their situation. 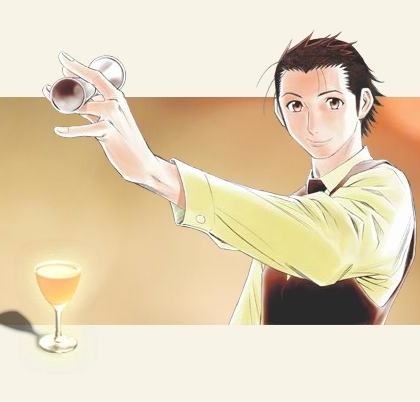 It was Ryuu's job to provide his customer with a drink that would soothe their problems and make a solution clear. The stories were always intriguing and easily kept my interest. It was nice to see someone walk out of the bar with clarity in their life and an answer to their predicament. It was also nice to see realistic problems- the characters were fairly easy to relate to. I really only had a few problems with the show, but they didn't really sap from my overall enjoyment or the satisfaction felt once I finished the series. It was nice to see past characters after their story had been told. but I didn't like how they were used as narrators. It was really confusing - especially at the beginning- to see characters from episodes ago relay plot points. Also, the episodes about the "mistake of Sasakura Ryuu" were kind of confusing; mostly because his mistake, so stressed upon by the passing narrators, wasn't really explained in full, and the two episodes spent on his "mistake" kind of warped Ryuu's character. Those episodes made him look childish and immature. Well, actually, his words and actions were nothing but gracious and polite, but the older bartenders chastised him for a mistake he didn't know he made- and the audience didn't either. I couldn't tell how long ago those episodes were because Ryuu looked exactly the same, so it was a little difficult seeing how much time it took for Ryuu to be the bartender he is now. In all, those two episodes were probably the worst of the show, though they weren't totally bad. I just found myself annoyed by the somewhat arrogant customers and older bartenders. Those are the only complaints I have, though. Bartender proved to be a wonderful series full of fascinating vignettes about passing customers and the drinks used to placate their problems. The dark Eden Hall bar, hidden in the alleyways of Tokyo, held a very sophisticated and refined aura while still managing to be homely and welcoming. A very enjoyable experience- I recommend it to anyone who likes episodical anime and/or holds an interest in bartending or cocktails. The live action ending theme was pretty cool. 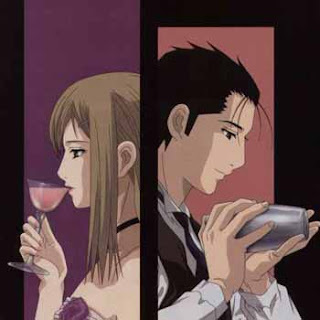 The fish swimming through the air, a real bartender making the drink mentioned in the episode, and - who I presume to be the actual artist- singing the ending theme in the background made the it very memorable. 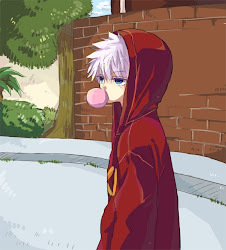 Why are 11 episode anime so good?? The reason the ending only got 6 (which is a "fine" on the MAL rating scale) was because the ending didn't really tie anything together. The old-man narrator just gives a speech on what it is to be successful bartender and the series ends. Nothing really fantastic. It's just fine. In other news, I got a B on this song. It was difficult, but very fun. :3 Just watching that video makes me want to play it again.